Minimum Requirements: Mac OS X 10.8 (Mountain Lion) or higher. Minimum Requirements: Mac OS X 10.6.8 (Snow Leopard) or higher. What is PDF OCR X? 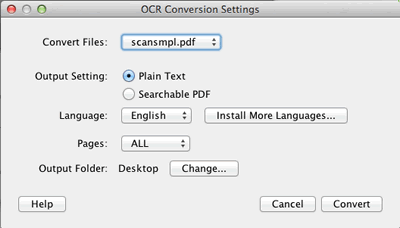 PDF OCR Converts your PDF to text or searchable PDF depending on your conversion settings. Supports PDF, JPEG, GIF, PNG, PICT, BMP, and most common image formats as input. Can convert to both editable text and searchable PDF. Batch Conversion (convert multiple files as a batch). Copyright © 2008-2019 Web Lite Solutions Corp., All rights reserved.